Register now your email address and never miss events, dates and news for GOTTHARD. Gotthard is a Swiss hard rock/heavy metal band founded in Lugano by Steve Lee and Leo Leoni. Their last eleven albums have all reached number 1 in the Swiss album charts, making them one of the most successful Swiss acts ever. With 2 million albums sold, they managed to get multi-platinum awards in different parts of the world. The band takes its name from the Saint-Gotthard Massif. 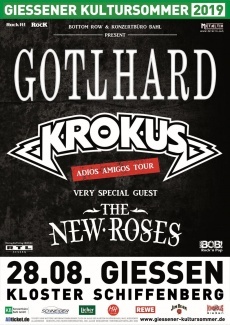 Gotthard recently toured with Whitesnake and played at Arrow Rock Festival in Holland. Singer Steve Lee died in a motorcycle accident on October 5, 2010. On November 11, 2011, Gotthard announced a new singer, Nic Maeder, through their official Facebook page and their website with their new song "Remember Its Me", downloadable for free.